My husband and two boys have an obsession with meat. I have talked many times about the endless amounts of bacon and bacon flavored products that they seem to be able to consume. Luckily, I have slowly begun to have them realize that there are other foods in the universe which can be healthy and delicious. Beans and lentils have been a pleasant surprise. I thought that when I started adding more beans and lentils into our diets that I would be meet with a lot of resistance and complaining. Instead I was pleased when my oldest son explained to me that he loved beans and ever since gets excited when he learns that beans will be included with dinner. My husband was a little more resistant, but after his stomach accustomed to the increase in legumes, he now likes them to the point that he prefers my lentil burgers to many meat equivalents. Of course he still adds bacon to his veggie burgers, but he's a work in progress. Soup is a major way that I have learned to add more legumes into my family's diet. Both of my sons absolutely love soup and lentil soup is one of my favorite soup varieties. Therefore, I was excited when the May issue of the Food Network Magazine had a recipe for Lentil Soup with Peas and Ham, which looked delicious and full of protein. This recipe has 13 ingredients. It takes 40 minutes of total time, 30 minutes of which is active and makes 4 servings. Luckily I already had red lentils from a previous recipe. For whatever reason the only store in my area that feels the need to have any type of lentils other than brown is the Lebanese market near my house. That market is great and I have found many hard to find items, plus it's always great to support neighborhood stores! For the onion I used a vidalia sweet onion. I love vidalia onions and I was excited to see that the first shipment was available at my local grocery store. They are great to cook with when they are in season. I was very pleased to find that all the cooking times in this recipe were very accurate. Oftentimes I find that recipes can be off by a very large margin, but I followed this recipe as written and had no problems. My family really enjoyed this soup. The only thing that I would change would be the peas. I have never actually seen fresh peas in my area, so I had to use frozen. I'm not a big fan of frozen peas, especially in cooking and this soup would be great without them. With the peas the soup almost felt off, so I would suggest omitting them completely. 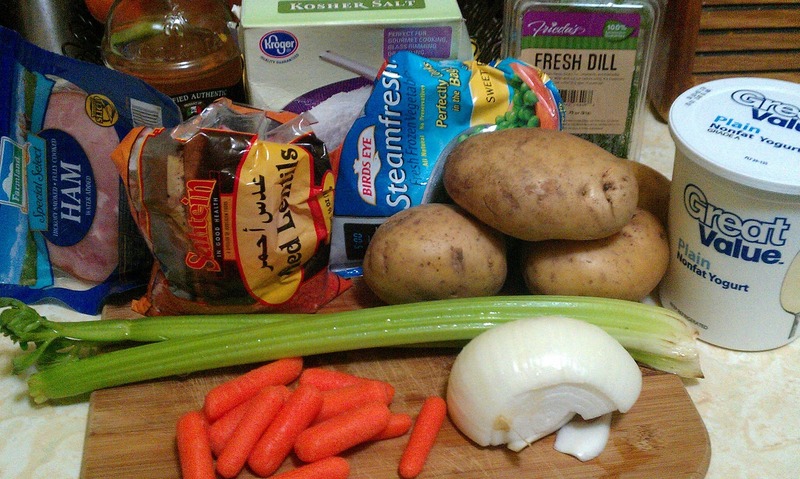 The dill taste is delicious and creates a nice fresh taste to the soup. The best part is that the recipe has 28 grams of protein and only 7 grams of fat per serving. A great way to provide a low-fat flavorful soup recipe to your diet. For the recipe go to Lentil Soup with Peas and Ham. Thanks for the sweet comments :) Your site looks great, followed you back! I'm so excited to try this :) I love soup, but my husband is not a fan (unless it's easy and out of a can) LOL. I wonder how well this freezes? Just followed you on Twitter! Looks good. My husband would love this. I am a new follower from the Blog Hop. Thanks, my husband really loved this soup also :) Have a great weekend! Thanks, it was pretty tasty :) Followed you back! Love the blog!!! Saw you on the Hop. Please follow me back!!! Thanks :) Followed you back, have a great weekend! My husband will add bacon to pretty much anything :) Supporting local shops is a must! Thanks :) It really did turn out well and re-heated great the next day! Going to follow you back now! I love lentils! My mom used to make them but the one time I tried to they didn't turn out so hot. Thanks for the recipe! I love lentils also, they are yummy! I agree though that you have to have a great recipe! I hate when I don't have the right ingredient :) It really is yummy I promise!